No one wants to hear that their commercial building’s flat roof needs to be replaced. Just the idea of it conjures up worries about massive expenses, messy job sites, and extended deadlines. But it doesn’t have to be that way. Empire Contractors is western Michigan’s premier commercial roofing contractor, offering a full range of roofing services to property managers and building owners, including flat roof replacement. When you hire Empire Contractors to replace your flat roof, you can rest easy knowing you are in good hands. At Empire Contractors, our motto is “Roof it once!” That means when you have your installed by Empire Contractors, you can count on that roof lasting for its entire projected service life or beyond, with no risk of premature failure. Call us today at (231) 861-7221 to get started. Do I Need A Flat Roof Replacement? By some estimates, as many as 80% of roofs are prematurely replaced. Many issues can be addressed with simple repairs or roof restoration, which Empire also offers, but there are some problems that may indicate your roof needs more than regular maintenance. You are continuously paying for repairs that don’t seem to improve your roof’s efficiency. Repairs are becoming more frequent or widespread. Your roof is exhibiting signs of structural deficiency. Your roof is reaching the end of its projected service life. 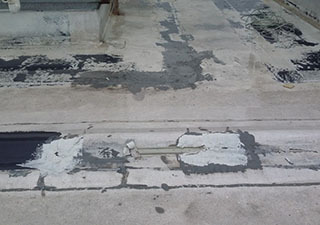 Your roof is no longer under warranty due to age or condition. We at Empire Contractors will never suggest a total roof replacement unless it is absolutely necessary. If you suspect your roof may need to be replaced, we will send one of our friendly, knowledgeable technicians out to your site for a thorough inspection before any contracts are signed. We will protect your commercial building during the re-roofing process by tarping or covering any landscaping or surroundings that could be harmed by falling debris. The roofers at Empire Contractors are fully licensed and insured and comply with federal safety standards, so everyone is covered in the case of an accident. We also make sure to keep the worksite clean, to reduce any hazards to safety. 2) Remove old roofing system. We don’t just tear off your old roof, we also dispose of it, taking care of any associated permits or landfill fees. With your old roof removed, we can carefully inspect the underlying structures for any issues or weaknesses, which we will address before moving on to the next step. 3) Install your new roof. We will walk you through the pros and cons of each and help you choose the flat roofing system that is best for you. After properly prepping the roof deck and replacing your roof, the roofers at Empire Contractors will clean up everything and complete a final inspection to ensure the highest level of quality workmanship. 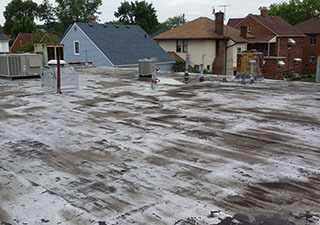 If your flat commercial roof needs replacing, don’t trust such a major undertaking to just anyone – Empire Contractors has more than 2 decades of local industry experience and will help you make the best decision regarding your new roof. Is invested in fulfilling your needs and goals. Keeps our insurance, certificates, licenses, and vendors current. Has office staff to make sure you will reach a representative that can assist you. Uses the latest in industry technology. Call Empire Contractors today at (231) 861-7221 to learn more.